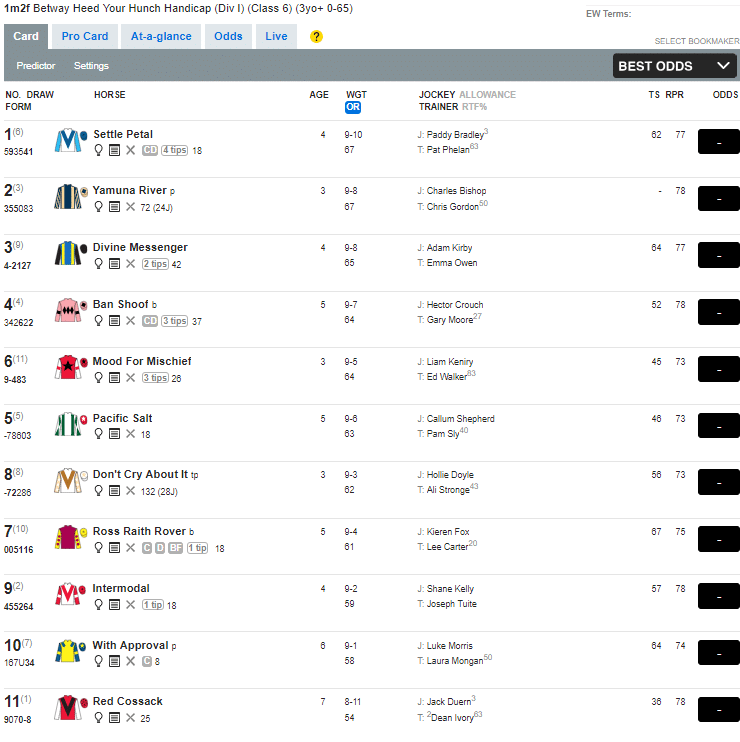 Is it Wise to Back Horses With Top OR and Racing Post Ratings? Best of Both Worlds: Should You Back Horses That Are Top of the OR and Racing Post Ratings? As you’re aware by now, a horse’s Official Rating (OR) is a ranking it receives from the British Horseracing Authority (BHA). In handicap races, a horse’s OR determines how much weight it carries in relation to the rest of the field. If you go to the Racing Post website, you will also see a Racing Post Rating (RPR) which is based on a horse’s ability relative to the weight carried. However, this is about the only information you’ll get as the publication won’t tell us the criteria used to formulate the RPR. I have ascertained that the RPR is typically the theoretical best performance of a horse and is probably based on their best ever run. The RPR of a horse is almost always significantly higher than its OR, and there are occasions where the RPR of an outsider is head-scratchingly high. Even so, in theory, it should be worth looking at horses that top the OR and RPR rankings in a race. As RPR is seemingly adjusted based on weight carried, a horse’s RPR would be higher if it was carrying less weight, and its RPR would be lower if it carried more weight. As the highest rated horse in OR terms is also top-weight, it makes sense to suggest that because it already has the highest RPR in the race, it should be the classiest runner in the race. In UK handicap racing since the beginning of 2014, only 17% of top OR-rated horses went on to win the race. Backing all of these horses would have resulted in a loss of 7.53%. Unfortunately, there is no data outlining how top-rated RPR horses have fared. Even so, it is worth seeing if horses that top both rating systems tend to have a decent chance of victory. While trying to find horses that met the criteria, it was striking to discover how difficult the process was. I looked at around 50 handicap races and didn’t find a single example of a horse that was clearly top rated in both OR and RPR terms. In the end, I settled for horses that were joint top of both ratings. 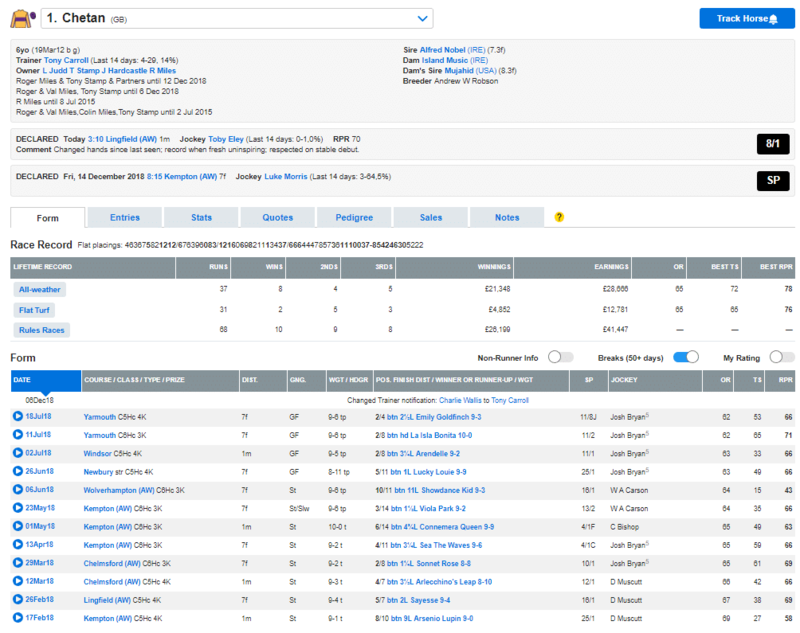 In the screenshot above, Chetan is the best-rated horse with an OR of 65 and has the joint highest RPR of 70. Despite three consecutive second placed finishes, Chetan was available at 9/1. On the face of it, Chetan is a value bet, but let’s look at his recent record. It is important to note that this is a Class 6 race over a distance of 1m 1f on Standard All-Weather Going. On the face of it, Chetan seems like a decent selection. He has two second placed finishes in Class 5 races recently, and his RPR is at its second highest level since November 2017. However, his OR is also at its highest level in over a year which means Chetan is carrying a lot of weight. His RPR suggests that Chetan can carry this burden, but the biggest issue is his inability to win. Chetan is winless in 17 races, and while he is an AW specialist, he hasn’t run at Lingfield very often. His last two races resulted in fifth and sixth placed finishes, although he did win at the track back in July 2016. However, looking through the list of rivals, Chetan has to be considered, and as it happened, he defeated Hic Bibi by a neck. I analysed this race when it was already finished, without checking the result. That’s why there are no odds available. It also enabled me to look at the race with being influenced by a horse’s price. In this example, Yamuna River has a joint top OR of 67 and also has the joint top RPR of 78. This is a 1m 2f Class 6 handicap on Lingfield’s AW course on Standard Going. It doesn’t take long to figure out that Yamuna River is not a good bet. The horse has no career wins, and her best performance to date was over 2m 1.5f on turf. On All-Weather, the horse had only managed third place on two occasions. The other issue is that there are several horses with the same RPR. Ban Shoof has a slightly inferior OR as Yamuna River but has the same RPR. Although he is two pounds worse off at the weights, Ban Shoof finished second by a neck in an AW race last time out and was also second in a Turf race at Brighton before that. This season alone, he has finished top three on four occasions from six races. 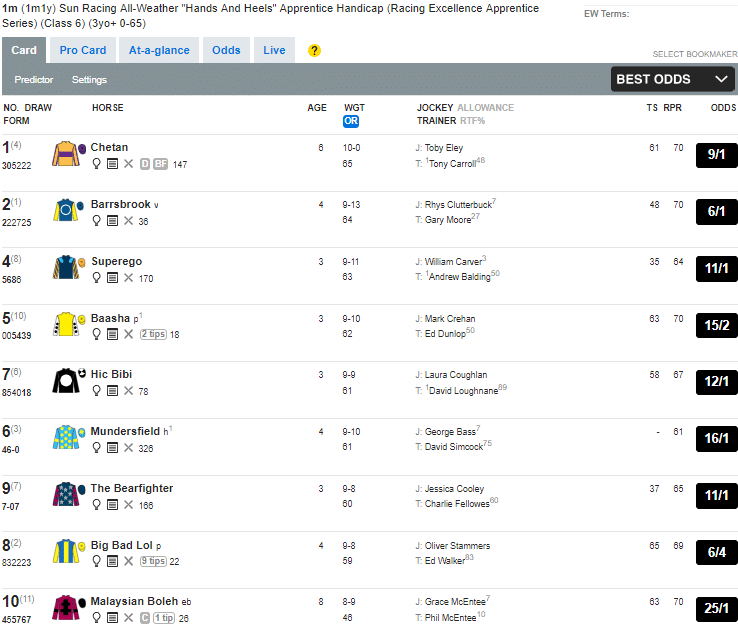 In the end, Ban Shoof won at odds of 9/2, while Yamuna River was a distant last place at 20/1. There are relatively few occasions each day where a horse in a handicap race is top rated in both OR and RPR terms. If you discover such a runner, it is definitely worth investigating their record, but don’t back the horse blindly. In example one, we saw that Chetan was in decent form, and had a real opportunity to break a winless streak. He wasn’t up against much, and at odds of 9/1, he was worth the risk. In example two, we saw that Yamuna River shared top RPR status with several horses and top OR with one other. The horse was in poor form and had never won a race. In the end, it flopped badly.